The view out of the fifth floor window at The Photographers’ Gallery is one of my favourite in London… a floor-to-ceiling clear aspect down Great Portland Street, hovering above Oxford Street and the hurried residents, shoppers, tourists, and general throng below. It also mirrors several of the large scale crowd images currently on display within Alex Prager’s mid-career retrospective. The American photographers’ “Crowd Series” features highly stylised shots of streets, beaches, airports and cinemas from an aerial perspective, allowing you to observe the scene from an unusual vantage point (echoed by the fifth floor window). In the middle of the still shots, a temporary cinema space projects Prager’s most ambitious work – a film installation. I must confess I am not typically a fan of film installations, however I was utterly absorbed by the narrative which jumps between close ups of individuals within the crowd before moving back into the swarm of people, and is projected across different and often multiple walls, before finally being projected on all three simultaneously! In addition to the crowd scenes, close up portraits of a Hitchcock inspired female surrounded by flapping birds, a brunette woman lying on a lurid green bedspread smoking a cigarette, a ballerina caught mid pose, and a female in a vivid yellow dress suspended from a red car bonnet hanging in the sky all compliment the film installation where Prager’s protagonist (within each crowd) is always a woman. Group shots and landscapes are also present; a trio of suited males taken from below looking up, a bikini-clad foursome chatting against a bright blue sky, a burning house against a deserted backdrop, and a congregation facing away from the camera to watch a rocket taking off, all enjoyably hark back to kitsch Americana! I’d certainly suggest a visit and immersing yourself in Silverlake Drive before it closes in October. ‘Cathedral of the Pines’ conjures thoughts of religious buildings carved from pine trees, but instead is name of a forest trail in the American rural town of Beckett, Massachusetts and the inspiration behind Gregory Crewdson’s latest body of work currently on display at The Photographers’ Gallery. It is the first time the Gallery has dedicated all three floors to one artist and contains all 31 large-scale images from this series, allowing visitors to view the entire body of work rather than just selected pieces. At first glance the exhibition as a whole can feel a little repetitive; with many images featuring bleak landscape scenes or simple domestic settings, however on closer inspection you begin to appreciate the detail and atmosphere created within each one. These details are often a little sinister; footsteps in the ground, an unexpected reflection in a mirror or window pane, or items that seem out of place in their environment. The people and settings in each frame also contradict each other, with figures standing still but naked in the snow, or on a riverbank, or as a couple in the back of a truck within a dense forest, making you question the narrative that has led up to each scene or ‘moment’ captured – and indeed what might come next. Credwson’s photography is famously likened to film as he creates cinematic-style sets and hires actors or models to pose within these sets, however this series recalls film in a more climatic capacity creating visual suspense in much the same way as directors Alfred Hitchcock or David Lynch. Unusually this series includes natives to Beckett as well as some of Crwedsons friends and family rather than actors or models, and he describes it as his most personal project to date. 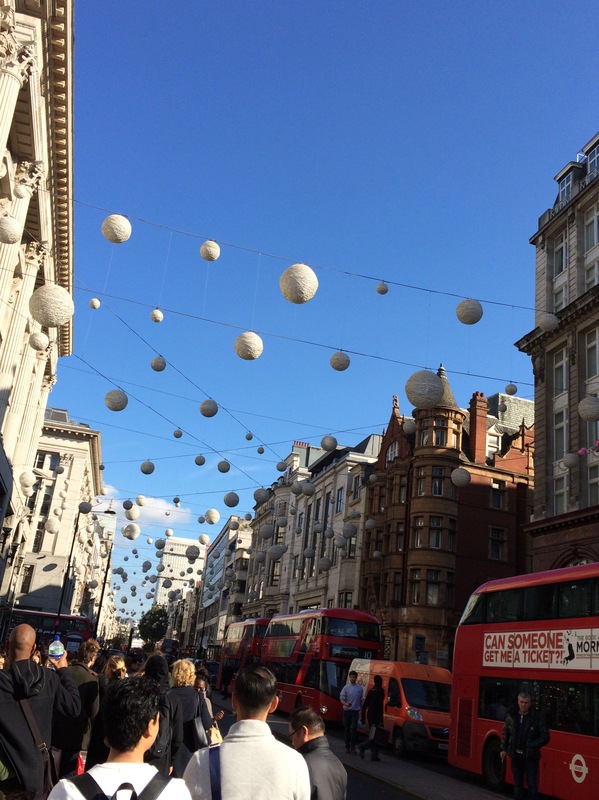 On display until 8th October it’s certainly worth escaping the crowds of Oxford Street and spending some time exploring the oddly calm dystopia of this exhibition! You don’t expect to see a restored vintage car on the 5th floor of a Soho gallery… but that’s exactly what greets you as the lift doors open on the top floor of The Photographers Gallery. 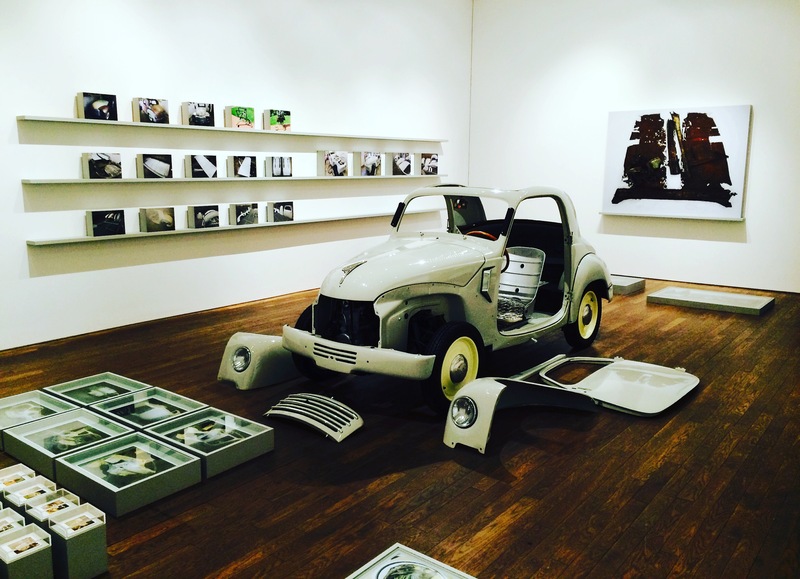 Dutch artist Erik Kessels’ Fiat 500 displayed alongside polaroid and larger scale photographic images on both the floor (those taken from above) and hanging on walls form his ‘Unfinished Father’ body of work, which is just one of four finalists in this year’s Deutsche Borse Photography Foundation Prize. 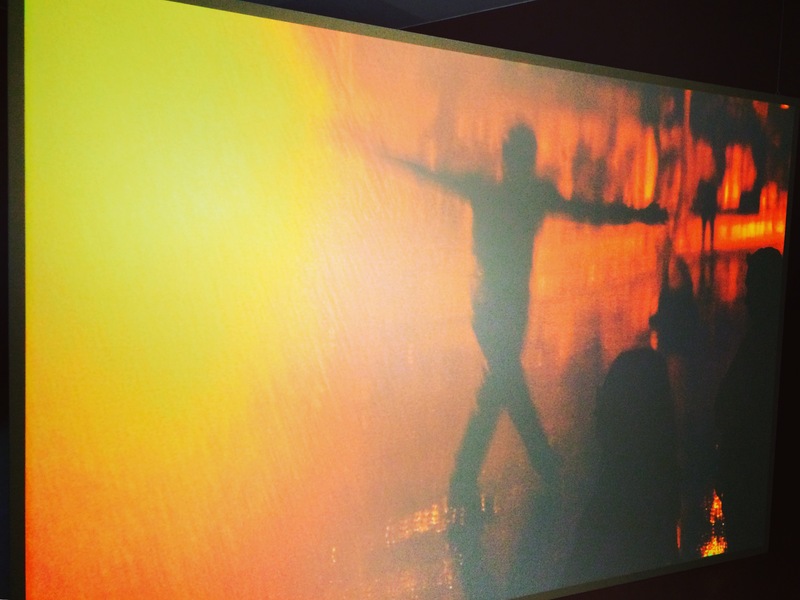 Behind Kessels’ work, the space darkens and a huge projection of yellow, orange and red broken by a black silhouette introduce Laura El-Tantawy’s entry ‘In The Shadow of the Pyramids’. This image has a painterly quality to it and does not immediately suggest riots (more specifically the Egyptian revolution of 2011) however as you move around this image, additional beautiful but harrowing portraits and sounds of the crowd intermingled with the artists voice annotate the socio-political conditions leading to the overthrow of Mubarak. 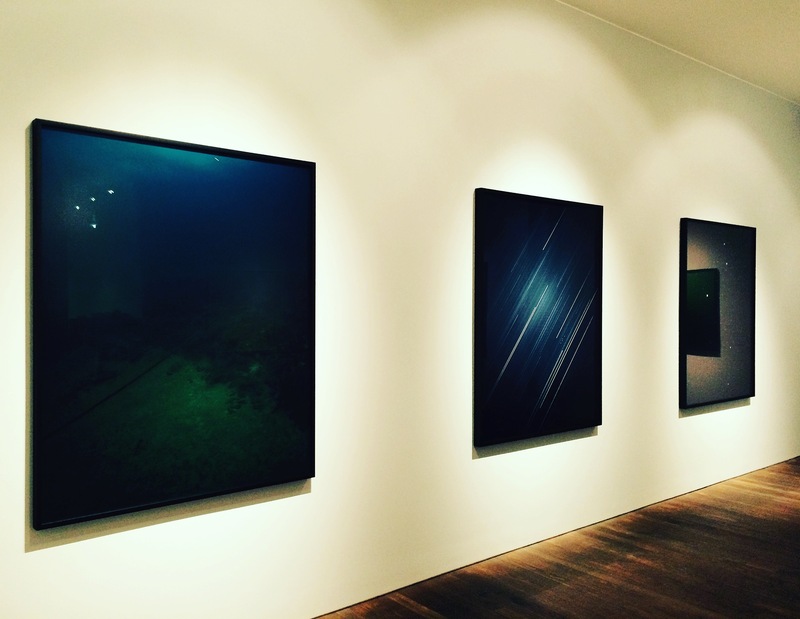 The floor below displays the two other finalists work; German artist Tobias Zielony and American artist Trevor Paglen. 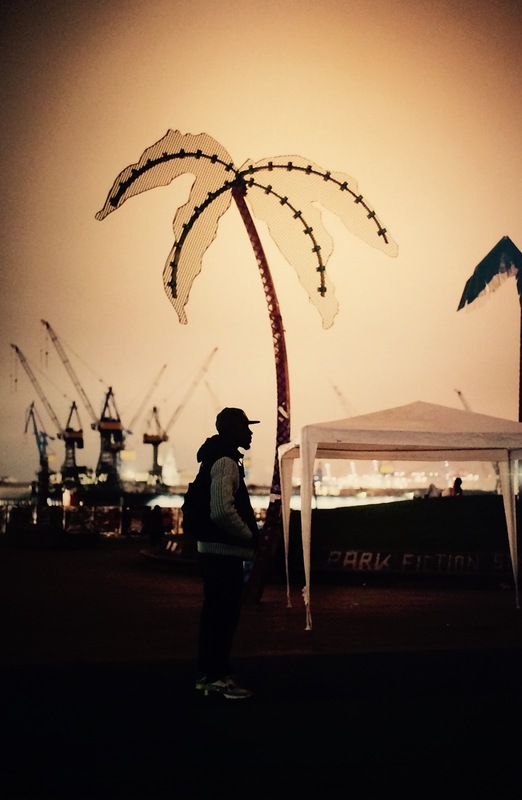 Zielony’s ‘The Citizen’ documents African migrants who arrived in Germany and protested about restrictions placed on them, alongside related newspaper articles. Similarly ‘The Octopus’ shows Paglen tackling a political theme, this time mass surveillance and data collection through his photographs of federal and military outposts, underwater fibre-optic cables and passing drones which expose these clandestine practices and raise questions about contemporary cultural politics. An annex on the 4th floor contains a plasma screen and headphones with artist interviews, as well as blue polling cards where visitors can pick their winner and offer an explanation behind their choice. Whilst Laura is undoubtedly my favourite, having seen the finalists’ work and read other visitors’ comments, it will be interesting to hear who is chosen at this years’ prize-winner in June. Visitors vote for their favourite! 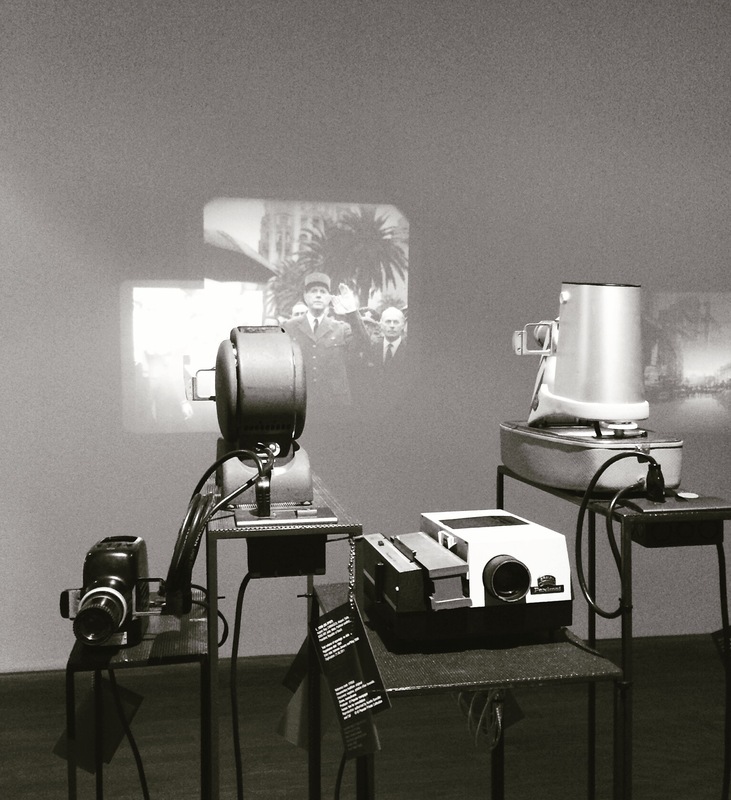 Five clusters of vintage projectors are littered across the 4th floor of the The Photographers Gallery, initially looking more like an art installation than a photography exhibition. Once inside the space you quickly realise that they are projecting images directly onto the gallery walls; moreover as a visitor you are encouraged to activate the projectors yourself and control how the various images appear and disappear, and are layered over one another. The images were all taken between the late 1950’s and early 1970’s by the Uruguayan photojournalist Aurelio Gonzalez, who hid 48,626 negatives from the press archive of the country’s Communist newspaper El Popular ahead of the dictatorships’ censorship in 1973. Gonzalez ensconced the slides in a wall cavity in his office building in Montevideo for decades, only recovering them in 2006! The Centre de Fotografia de Montevideo subsequently restored, classified and digitised the archive, and in 2011 the Brazilian artist Rosangela Renno created this exhibition in response to the images. Obviously some heavy editing needed to be done with an archive approaching 50,000 photos, so Renno chose a small selection of images which best depicted the economic decline, protest and civil unrest that preceded the coup, and manipulated the archival black and white slides into digital images we see in this show. 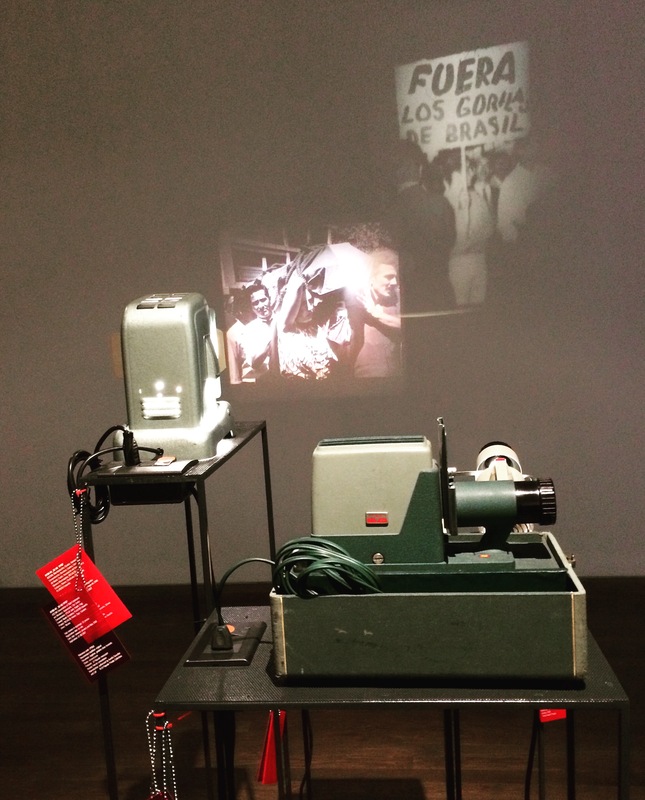 Little of this uprising survives in historical or photographic records, and Renno endured similar conditions herself during the military repression of Brazil during her lifetime – making her an apt artist to tell this story. Small red plastic tags attached to the projectors list search terms from the archive’s cataloguing system, offering insights into how the archive has been organised and increase your level of engagement with the photos. Likewise the constant clunking mechanisms of the old projectors intermingles with the Communist Internationale music playing in the background, making the images appear even more powerful. Seven large-scale photographic images dominate the top floor of The Photographers Gallery, making a bold impression by Noemie Goudal in her first solo London exhibition. All seven works on display in ‘Southern Light Stations’ are entirely new, previously unseen pieces created this year. As soon as you enter the Gallery you can’t help but notice the floor to ceiling observatory-style architectural structure which houses six glass stereoscopes. 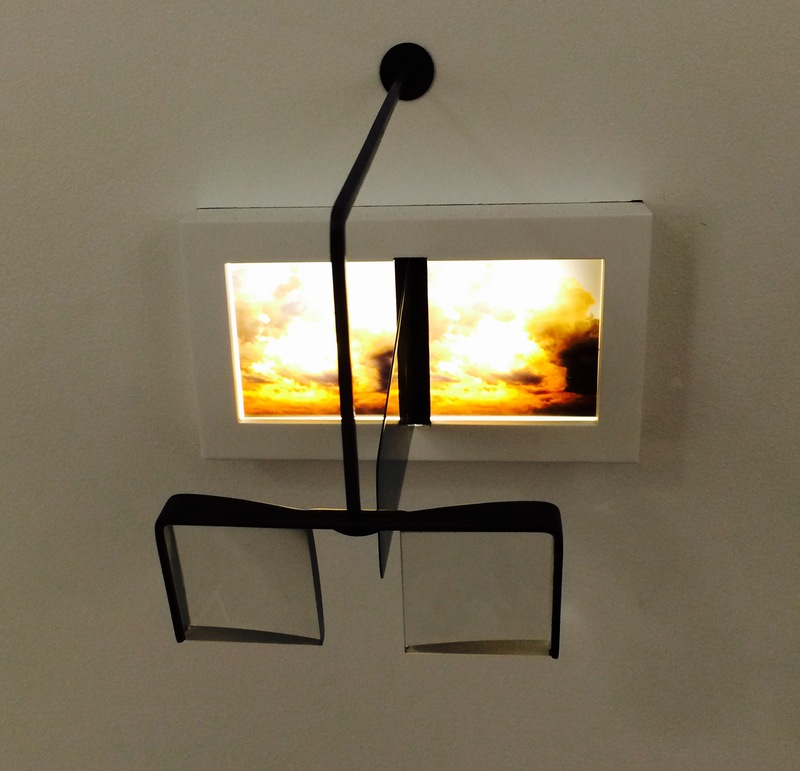 These cleverly display pairs of separate cloud images, creating a single three-dimensional image by depicting left-eye and right-eye views of the same scene. Clouds and the sky prove to be a recurring theme in Goudal’s work and indeed this exhibition as four of the large-scale photographic images show spherical objects (which could be the sun, moon, planets or other celestial bodies) floating above different landscapes including the sea, mountains, a desert/sand, and a beach/pebbly surface. After closer inspection you can also see ropes, scaffolding and other signs of construction around the spheres, alluding to the artists’ interest and research into early astronomy from antiquity, through to the Middle Ages and pre-Enlightenment. These spheres are accompanied by three photographic images of large-scale telescopic structures suspended above water; these ‘Towers’ are mythical, otherworldly and not dissimilar to some of the concrete structures that survive across Eastern Europe following the collapse of communism – and highlight Goudal’s desire to play with the real versus the imagined. The exhibition also plays with darkness and light as two of the spheres are very dark (perhaps referencing an eclipse) whilst the other two are incredibly light and almost merge into the clouds they are floating in. 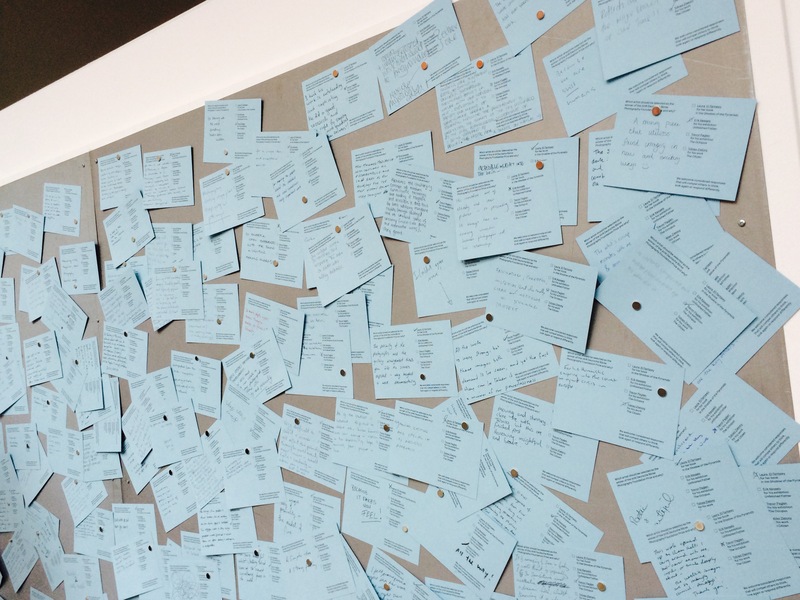 The fact that there is no interpretive information inside the exhibition space forces visitors to really look at the images, think about what they are viewing and question exactly what they may or may not be. The second floor of The Photographers Gallery is currently dedicated to the work of British female documentary photographer Shirley Baker, and is aptly titled ‘Women and Children; and Loitering Men’. The photographs are predominantly black and white (although colour images are hanging on two walls towards the back of the space) and as the title suggests it heavily features images of women and children as well as unemployed men – a trilogy who regularly act as her protagonists. All of the images were taken during the 1960’s and 70’s in Manchester, Salford or Hulme and document the urban clearance projects of that era in a very real and moving way. None of the images feel forced or staged and they all depict wonderfully banal activities; everyday scenes of women pushing prams, men walking the dog, children playing in the rubble and debris of derelict buildings, graffiti, and families sitting on the pavement outside their homes. Visitors are welcomed by a floor to ceiling black and white image of kids playing cricket in the terraces with old shop signs for Park Drive Cigarettes and Cherry Blossom Soda accompanied by a background soundscape of cars, metal hitting cobbles, an ice-cream vans’ jingle and people talking about the clearance programmes and the impact they had on communities. Despite the bleak content, I like the fact that the exhibition manages to escape being overly sentimental (and indeed depressing) and there are countless images of children smiling and laughing, leaving viewers to question are they happy or oblivious? Although I certainly prefer the mono images, the colour photographs do add to the show and complement their black and white counterparts, adding more life. And a single display case in the middle of the room presenting archive articles from The Guardian, The Economist and photographic titles featuring Bakers’ work help add further context.